Detailed Description: Thomas & Betts Straight Cord connector has malleable iron construction with neoprene bushing that provides high impact resistance and ductility. It measures 3-15/16 Inch diameter x 4-1/4 Inch. Connector has a throat size of 2-13/32 Inch diameter and thread size of 1-1/32 Inch length. 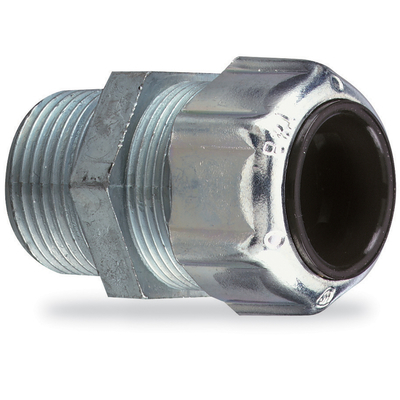 It is designed to connect a conductor size of 2.156 - 2.360 Inch and can withstand a temperature of 105 deg C. Connector features gland nut design that restricts the cable bending. It forms a liquid tight connection and provides ground continuity for cable armor. Male connector has trade size of 3 Inch for providing superior connectivity. It has elaborated range with effective strain relief that provides superior flex life. Cord is suitable to form a mechanical non-slip connection/termination for flexibility and is resistant to water/oil. Connector is ideal for use in hazardous locations. Cord connector is suitable for passing into an enclosure, connection through a bulkhead and into a rigid conduit. Cord connector is UL listed and CSA certified. Application Suitable for Use In Hazardous Locations Where General Purpose Equipment is Specifically Permitted by NEC 501-4(B).